I stream the news on my phone most mornings as I wake up, taking it from bedroom to bathroom, from kitchen to wherever. 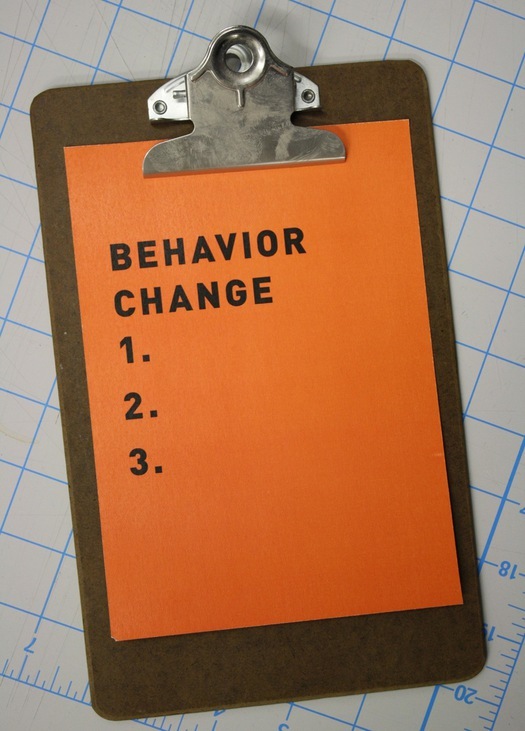 In January I heard a report about behavior change that stopped me in my tracks somewhere along the way. I think a lot about how designers can tweak their process to produce positive behavior change. That report on NPR, "What Vietnam Taught Us About Breaking Bad Habits," helped me think about the topic in a new way. In it, reporter Alix Spiegel investigated why people break their New Years resolutions. Spiegel started her report by reviewing how the US government helped heroin-addicted soldiers who served in the Vietnam War. I was shocked to learn that 15 percent of them got hooked on the drug. President Nixon created the Special Action Office for Drug Abuse Prevention to deal with the problem and appointed Dr. Jerome Jaffe to head up the effort. As part of their agenda of rehabilitation and prevention, the soldiers were required to dry up before leaving the country. To me this sounded like too simplistic of an approach to tackle such a big problem. However, Dr. Jaffe charged psychiatric researcher Lee Robins with the task of surveying the soldiers to learn how many relapsed after returning home. According to Robins' finding, that number was only 5 percent. In contrast, nearly 90 percent of heroin addicts who live in the US and try to quit end up relapsing. Could a design initiative produce similarly successful results? I have had many conversations with designers and educators who are dubious of the recent surge of what some call "social design." They claim that these projects rarely lead to real behavior change and provide arguments to back up their claim: the limitations of the 16-week semester during which many of these projects take place, the strategic flaw of designing for, not with the people they are trying to help, and the fact that many of the outcomes are inherently difficult to track and measure. Some of the results may not be measurable at all, especially in instances where the design is not being used commercially. While these are good arguments, Spiegel's report provides more clues that might help designers craft solutions that influence behavior. Spiegel interviewed psychologists Wendy Wood and David Neal, both of whom research behavior change. Neal pointed out that public awareness campaigns generally work for actions that people perform infrequently, like giving to a charity or donating blood. However, these campaigns do not work well when it comes to habitual actions, like smoking or eating. The reason for this is because our environment comes to shape much of our behavior. According to Wood, 45 percent of our behavior throughout the day is repeated. She describes us as being "integrated" with our environment; we spend most of our time in just a few locations where it becomes easy to form complex routines and a myriad of habits. Neal highlighted a familiar scenario that demonstrates how environments can shape our behaviors: "For a smoker the view of the entrance to their office building — which is a place that they go to smoke all the time — becomes a powerful mental cue to go and perform that behavior." He suggests that the best way to create behavior change is to "disrupt the environment" in a way that might help to "alter the action sequence and disrupt the learned body sequence that's driving the behavior," which allows us to snap out of our learned behavior and "reassert control" of our actions. So smokers who want to kick their habit might use a different entrance into their workplace in order to eliminate that cue. Vietnam veterans beat their heroin addiction by leaving the place where heroin was easy to get, by changing their social circle, and by adjusting to a new daily routine. All of these changes in environment helped to modify their behavior. Before I Die is an interactive public art project by Candy Chang that invites people to share their hopes and dreams in public space. So how can we designers work to disrupt environments that may trigger behavior change? At least a few designers regularly work this way, one of whom is Candy Chang. Chang creates urban interventions in derelict public spaces. 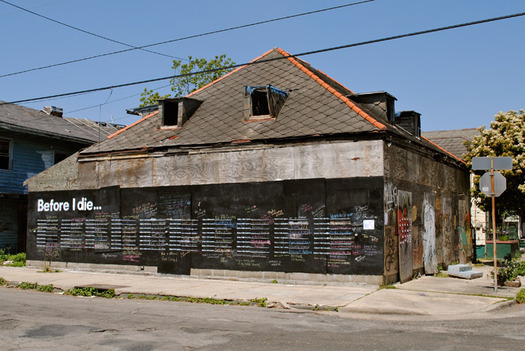 One of her inspiring projects, Before I Die, prompted passersbys to "share their hopes and dreams in public space" by filling in a graphic template that she spray painted on the side of an abandoned house in New Orleans. People were quick to stop, fill in the blanks, and become part of larger conversation. Chang's passion to create these conversations is contagious. In fact, she set up a set of instructions on the project website so that others can create their own "Before I die…" installations. 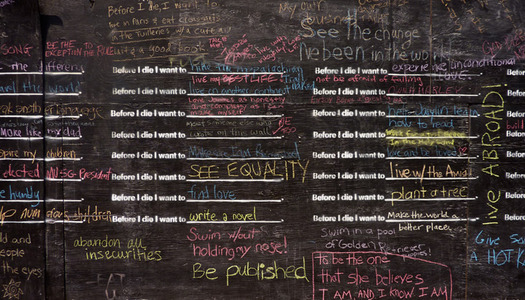 According the website, Before I Die is projected to spread to over 30 cities worldwide. The kind of temporary behavior change that results from this disruptive design is more qualitative than quantitative, but there are hard numbers to back up the importance role that environment plays in shaping our behavior. I discovered my favorite example of disruptive design about 10 years ago, between flights at Amsterdam's Schiphol Airport. This was not a slick new airline logo that attracted new customers or an innovative wayfinding system that helped people find their flights. It was the realistic image of a small black fly inside the white urinals in the men’s bathroom. When I first saw the fly, I wondered why it stayed put. Then I looked to the empty urinal next to me and spotted the same fly. They all had them. In response to dirty bathrooms caused by men urinating on the floor, an airport maintenance worker suggested that they etch the image onto the urinals to give men something to aim at as they hurry to and from flights. According to NPR science correspondent Robert Krulwich, who gave a fuller account of the story, the man thought back to his time serving in the Dutch army during the 1960s, when red dots had been painted on the latrines in the barracks to improve cleanliness. Sure enough, spillage rates in the airport men's room dropped an estimated 80 percent after the fly was introduced, leading to a much cleaner bathroom. The story not only highlights our instinct to aim at targets, but also shows how a routine action can be disrupted by a simple, strategically-placed graphic. Every design project poses a unique set of challenges and there is no full-proof formula that can always lead to behavior change. However, designers can benefit from Wood and Neal's insights about the role that environment plays in our actions. Consider their advice by asking how your design can disrupt an environment where frequent behavior occurs. Andrew Shea is the author of Designing for Social Change, with an introduction by William Drenttel, published by Princeton Architectural Press in March. Regretfully, the social design initiatives are desperatley attemtting to help the people in their individual fights with vice like drugs, smoking, etc. but rarely succeed in accomplishing their mission- so they need such a strong provocation with which to make impact. A schocking provocation, I would add. 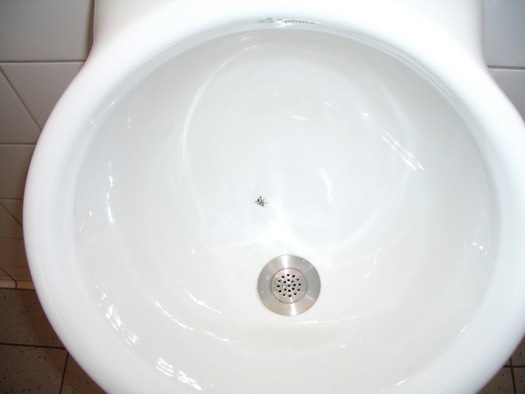 There's a bit of history around the insects in urinals design story as well - in England and Australia porcelain urinals were decorated with an image of a bee for exactly the same reasons you outlined above. The joke was that the Latin name for bee is Apis, deftly highlighting the activity taking place! I am currently in a graduate student in a class being taught by Andrew Shea and came across this article months ago (at the time I had no idea who Andrew Shea was so needless to say I am pleasantly surprised to find myself in his class now). When I first read the article I was inspired about the capacity for design innovations to facilitate small shifts in our everyday behavior. I like to think about how design can have reach (i.e.-spark a dialogue about an issue) beyond delivering aesthetic pleasure through interventions that are both critical and productive. This article represents a kind of thinking that I find useful and very much forward-looking.